Ahead of the June date for the inauguration of the 9th Assembly and election of its principal officers, certain leaders of the North central zone have appealed to President Muhammadu Buhari and the leadership of the All Progressives Congress not to punish the zone for the perceived ‘sin’ of the incumbent Senate President, Senator Bukola Saraki. The duo of Senator Bukola Saraki and Honourable Yakubu Dogara, had emerged as Senate President and Speaker of the House of Representatives, respectively of the outgoing 8th Assembly in 2015, against the party agreement which zoned the offices to the Northeast and Southwest zones. 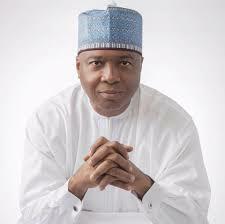 Both Senator Saraki and Honourable Dogara are from north central and northeast geopolitical zones. Further findings revealed that for the 9th Assembly, the party stakeholders have since zoned the office of Senate President to the Northeast and settled for Senate Majority Leader, Ahmed Lawan from Yobe state. There are insinuations that the position of Speaker of House of Representatives may be zoned to the Southwest while the south south would produce the Deputy Senate President. Addressing newsmen on Tuesday in Abuja, the Leader of the North Central Elders’ Forum, Alhaji Muhammadu Ari Gwaska declared that the North central be allowed to produce the Speaker for the Green Chamber as he noted that the zone came second behind the North west in the volume of votes delivered to the APC presidential candidate, President Muhammadu Buhari in the February 23 election. He said:”The North Central is too strategic to be relegated in the sharing of power equation in Nigeria. Since the adoption of the Presidential system of government in Nigeria, from the Second Republic to date, the Zone has continued to play a strategic role in representative government and bridge building. “Lest we forget, in the aftermath of the 2015 general elections, the Zone was ignored in the appropriation of the spoils of office when the Senate presidency was zoned to the North-East and the speakership zoned to the South-West in addition to the position of Vice President which the Zone occupies.